Subscribe for emails regarding our holiday specials, clearance items and new releases! Home > DVDs - Special Price! 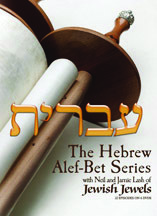 Join Israeli Hebrew scholar Dr. Danny Ben Gigi as he gives an explanation of each of the 22 letters of the Hebrew alphabet including its word picture, sound, numerical value, sacred meaning, and much more. A jam packed 11 hour series! This set which tells about every character is outstanding in every respect. I find myself wishing that someone would do the same for other languages which use symbols unlike the English language. They have made Hebrew even more interesting than it already was. Passover DVD w/ BONUS Teaching CD "Messiah our Passover"
Copyright Jewish Jewels. All Rights Reserved. eCommerce Software by 3dcart.